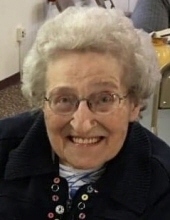 Margaret C. Hall, 96, of Merrill passed away Wednesday, January 23, 2019 at Bell Tower Residence, Merrill. Margaret was born April 15, 1922, in Merrill, daughter of the late Michael and Josephine (Jablonski) Myszka. She spent most of her life in Merrill where she met her true love, Everett Hall. They were married on October 11, 1941 in Des Moines, Iowa. He preceded her in death on February 15, 2003. When they first married, Everett was an aerial photographer for the government and traveled all over the United States. Margaret had the opportunity to go with him when he went to Nevada, Colorado and Oregon. Margaret was a member of St. Francis Xavier Catholic Church, Merrill, where she taught catechism for 20 years. She also helped with the lunches and banquets at church and was a member of the Homemakers Club. She loved to quilt and was very proud of the many quilts she made. Margaret also enjoyed sewing, gardening, picking raspberries and making jam. She also liked to work on jigsaw puzzles and crossword puzzles. Survivors include her daughters, Donna Michalski (Phil Huebler) of Tomahawk, Barbara (Gary) Zimmerman, Mary Tessmer, Jeanne Brock, Julie (Allan) Kanitz, all of Merrill, Cammy Westerdahl of Woodville, WI and Yvonne (Will) Sorby of Hortonville, WI; sons, Phillip Hall of Wausau, Daniel (Nancy) Hall, Patrick (Jean) Hall, John (Renate) Hall, Chuck (Gloria) Hall and Peter (Kim) Hall, all of Merrill; 29 grandchildren; 45 great-grandchildren; 8 great-great-grandchildren; 13 step grandchildren; 16 step great-grandchildren; 6 step great-great-grandchildren; and one sister, Catherine Vignali of Michigan. Margaret was preceded in death by her husband, Everett Hall; parents, Michael and Josephine Myszka; children, Teresa Hall, Douglas Hall and Tom (Dottie) Hall; granddaughter, Ingrid Hall; son-in-law, Mike Brock; daughter-in-law, Julie Hall; Phil’s partner, Irene Blaskowski; and siblings, George, Frank, John, Paul, Don, Dave, Lenore, Joan, Richard and Irene. The Mass of Christian Burial will be celebrated at 11:00 A.M. on Monday, January 28, 2019, at St. Francis Xavier Catholic Church, Merrill. Father Chris Kemp will preside. Burial will follow in St. Francis Xavier Cemetery, Merrill. Visitation will be from 2:00 P.M. until 5:00 P.M. Sunday, January 27, 2019, at the Taylor-Stine Funeral Home, Merrill. To send flowers or a remembrance gift to the family of Margaret C. Hall, please visit our Tribute Store. "Email Address" would like to share the life celebration of Margaret C. Hall. Click on the "link" to go to share a favorite memory or leave a condolence message for the family.